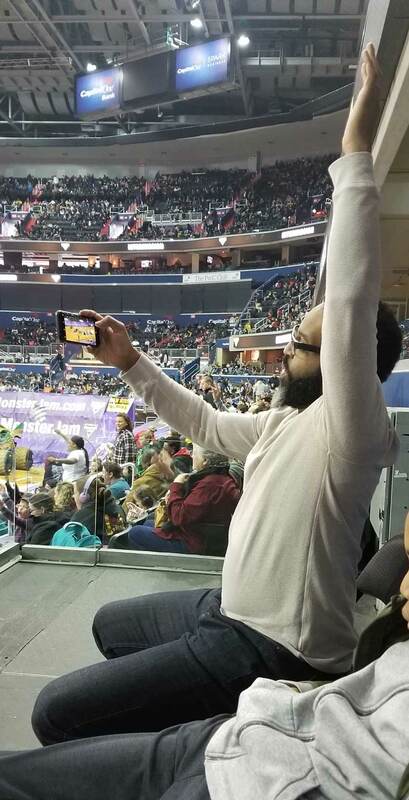 My son, his friend, my husband and I headed to Capital One area after church to check out Monster Jam, and a few things surprised me. Growing up in the south, we had funny car, drag racing, monster trucks, and all kinds of vehicle based entertainment, but those weren’t sporting events that “people like us” went to see. 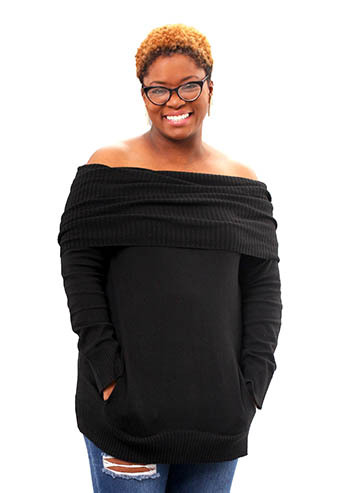 By “people like us” I don’t mean black – I knew black people went to racing events – but many of us ASSUME that a lot of racing events had a “type” of attendee. Monster Jam Truck in Flight! “People like us” might watch all sorts of sports on TV (I truly enjoyed dirt bikes and motor cross), but attend? Not likely. And on that note, let me just jump into this list. Here are five things that you need to know before you go to Monster Jam. 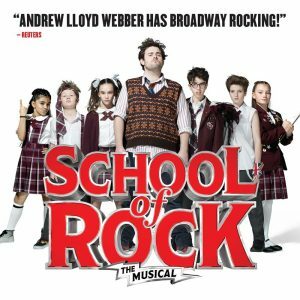 Disclosure: I am a Feld Family Ambassador, and in exchange for my time and efforts in attending shows and reporting my opinion within this blog, as well as keeping you advised of the latest discount offers, Feld Entertainment has provided me with complimentary tickets to Feld shows. I got this rare kiss for taking him to Monster Jam! 1. Leave your expectations at the door. EVERYBODY LOVES MONSTER JAM. I don’t think I have been to an event THIS diverse in age and race in a long time. 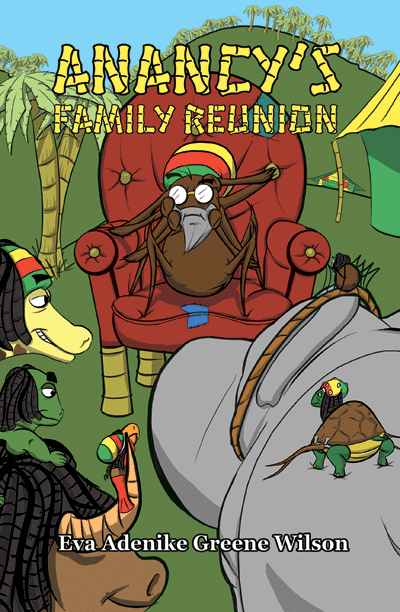 There were infants (LOTS) and seniors, Lynyrd Skynyrd beards and high top fades, yoga pants and dad jeans, stilettos and sneakers – everyone was there. The diversity continued on to the drivers too! 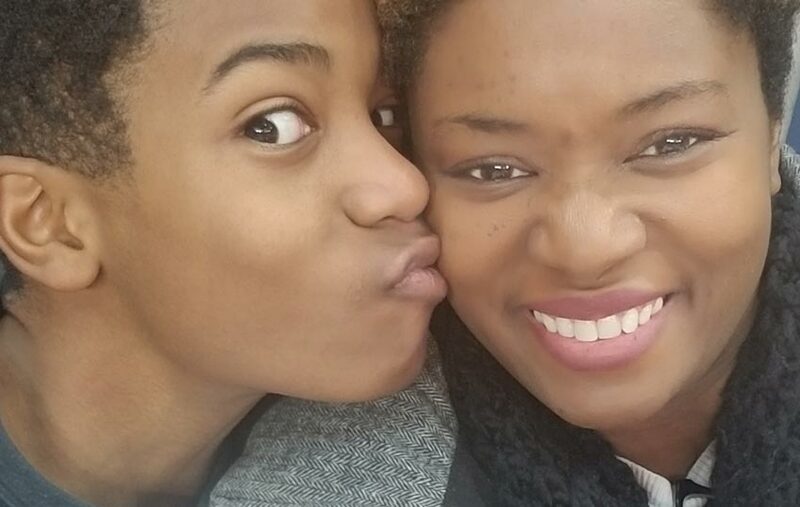 Women drivers were front and center, and Monster Jam has drivers of color as well. Like most sporting events, there was the national anthem, a thank you to the veterans, and a flag big enough to make to least patriotic person feel proud to be in America. 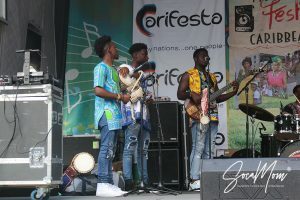 In today’s climate, it felt good to see so many people from so many different backgrounds all in one place with their families enjoying the event. 2. Don’t forget your headphones/ear protection. Friends, it is loud. 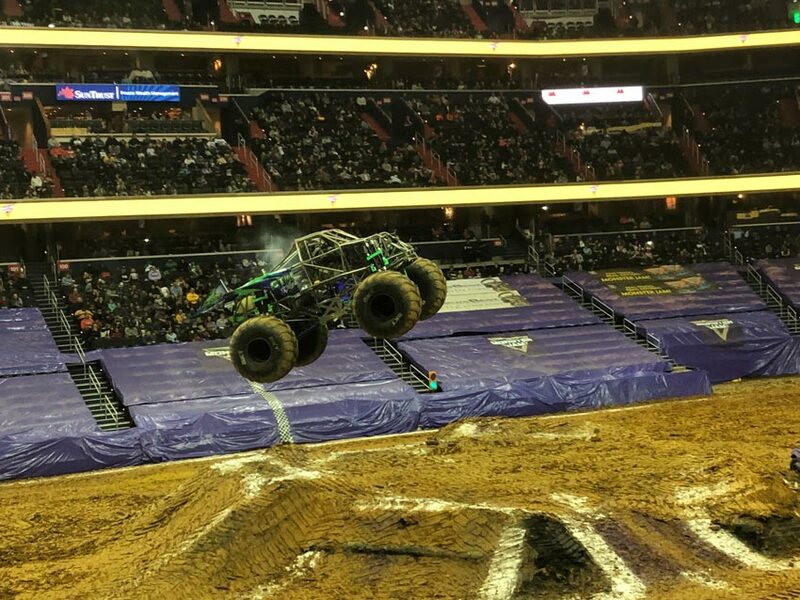 Not like concert loud, or fans at a basketball or football game loud – IT IS MONSTER TRUCK LOUD. You can buy them onsite, but you will pay handsomely for forgetting to bring your own. Earbuds will work too. Capital One arena had earplugs for a dollar (cash only – but of course there were ATMs because, Capital One), so we got some of those. They were surprisingly effective, but I am sure headphones would have been more comfortable. At $25 a piece for the over the ear protection, we opted for price over comfort, and it was fine. If you buy them ahead of time, you can get them on Amazon for about $10. 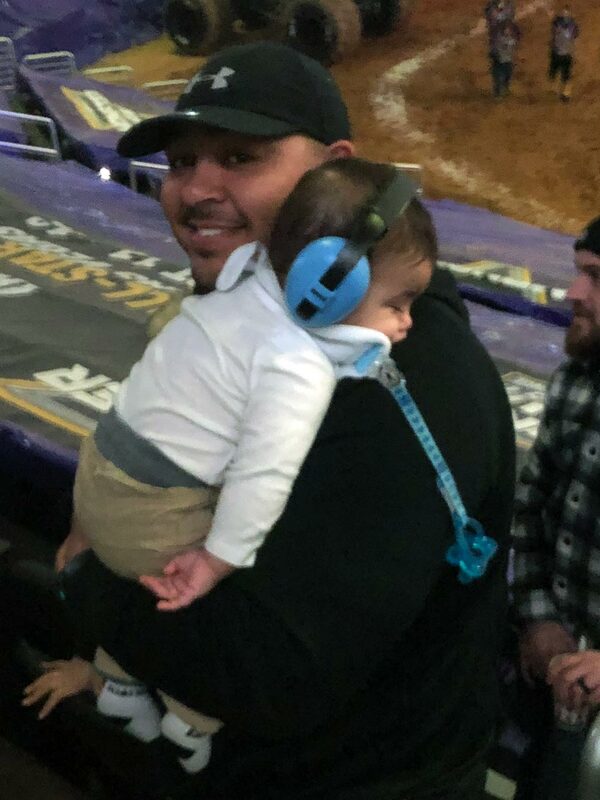 This dad was happy to take his little one to his first Monster Jam! 3. Eat before you go. The event is about two hours, and while concessions are available, nobody – kid or adult – is going to want to stop cheering and eat. You may jump out of your seat inadvertently and spill everything. I caught myself cheering unexpectedly on more than one occasion. 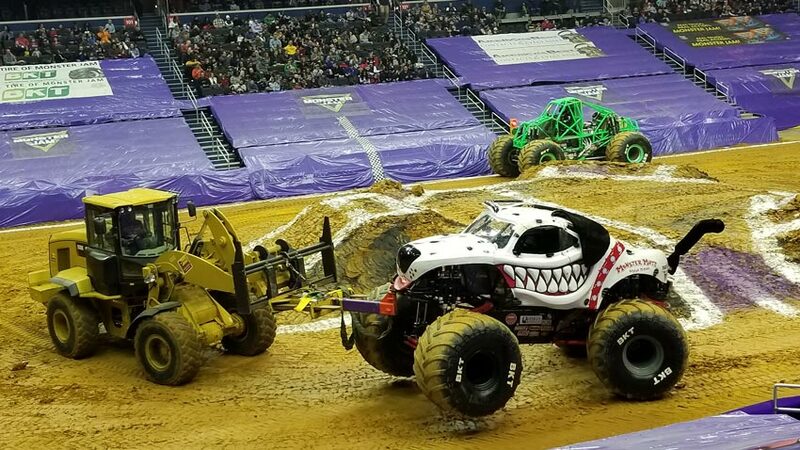 Food can also be expensive, and you may want to save your coins for some Monster Jam swag like a t-shirt, toy replicas of the trucks, photos, or a Gravedigger mask. 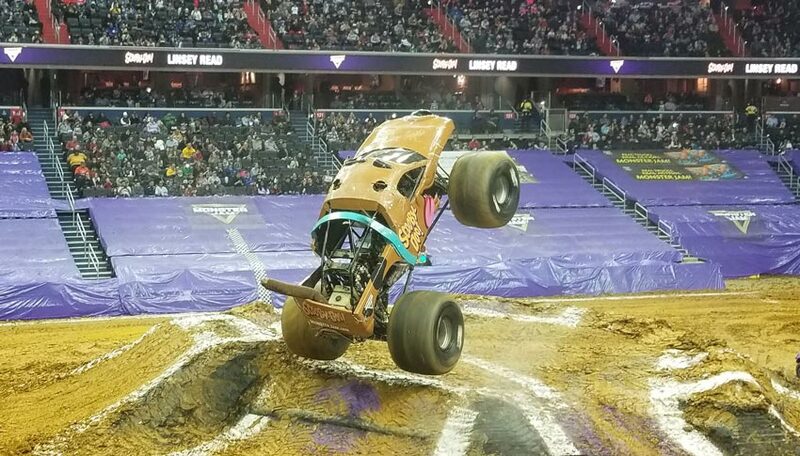 Scooby Doo at Monster Jam 2019. 4. Dress comfortably. There’s a lot of exhaust, so I figured that the reason it was so cold in there (besides the fact that it was January) was that the place had to be properly ventilated. I didn’t take off my jacket or scarf the whole time, and most people stayed bundled up. There’s no dress code for Monster Jam, so wear that you want. You won’t get dirty from the stands – at least we didn’t and we were pretty close to the front. Dancing shoes are a must if you want to end up on the dance cam. When you’re heading to Monster Jam, make sure you have comfortable clothes for cheering, dancing, etc. 5. Bring a smartphone. If you don’t know about the drivers, go to monsterjam.com and read up on them so that you and the kids can pick a favorite. If you don’t have time, you can read when you get there on your smartphone. You’ll also need your phone to take photos and upload them to social media. 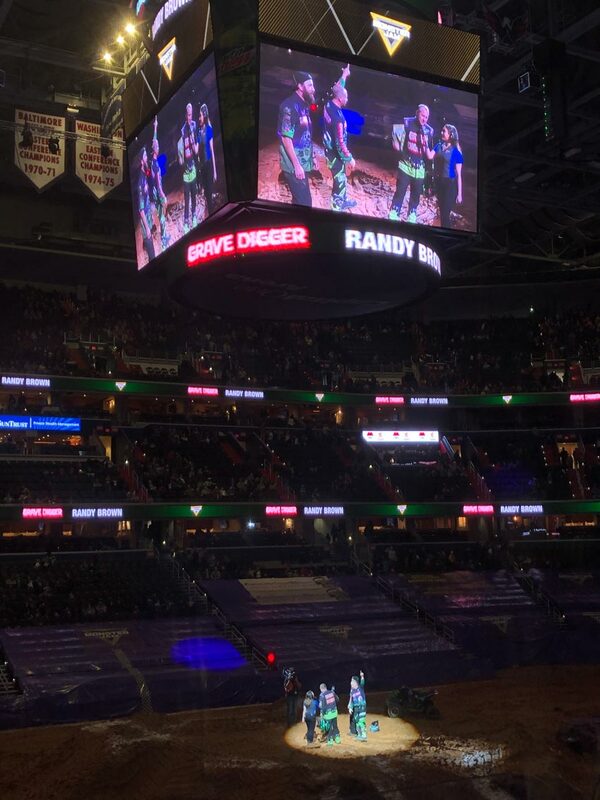 If you add the hashtag #monsterjam, your photo may be featured on the big screen! AND, you’ll need your smartphone to vote. 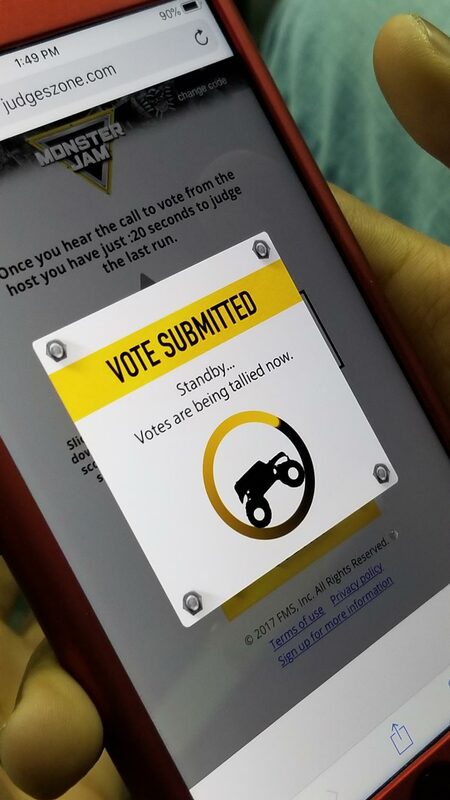 They’ll tell you the code once you are in the arena, and you can log on and enter a score after each truck does its thing! As expected, my car obsessed son had a blast. He cheered, he voted, he took photos, and he was super happy that he went. My husband, may have had more fun than all of us. 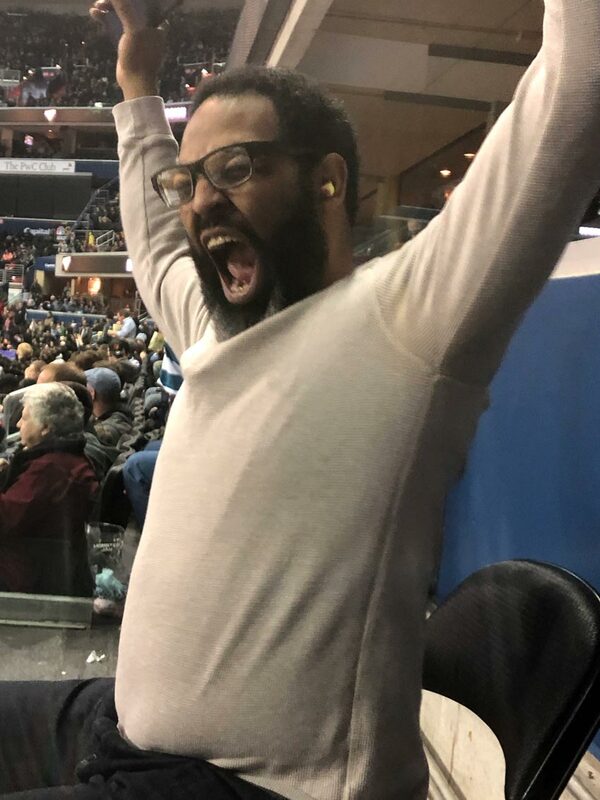 Like me, growing up, he just watched these sorts of events on TV, and when the monster truck commercials came on TV on Saturday mornings, he longed to be in the middle of the action. He was so ready. “Sunday! Sunday! Sunday!” He yelled that out at least three times in the car on the way to Monster Jam… on a Sunday. Does it get any better than that? Find out when Monster Jam is coming to a city near you on MonsterJam.com. Check out the action on social media by following the hashtag #monsterjam. 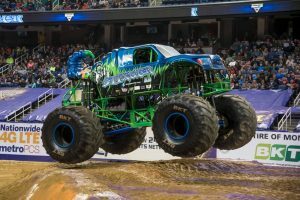 Have you been to Monster Jam? Do you think you would enjoy going? Tell us in the comments! Looks like a crazy fun time. Wow! This looks so intense. I never knew this sport would attract such a diverse crowd! That’s awesome. Sounds like you all had a great time. This looks like so much fun. I have never been to one although I have promised my son for a while to take him. I will see if it’s coming to town and get tickets. Whowudya thunk? But, wow!, it looks like lots of fun. Your hubby looks like he had a blast. This looks like fun!! I should take my 11 year old! I never would have thought I would be interested in a monster truck event, but this looks like crazy fun! I may try it this year! I’m sure I’ll enjoy it. This picture of your husband makes me crack up so hard. This is pure excitement, we’ve been to Monster Jam twice now and your tips are spot on. The picture of your husband is everything LOL! We went to Moster Jam a few years back and had an amazing time! I have been wanting to take my kid to monster jam for years now and still haven’t been. It’s coming to town though so I should just go. This is definitely an event that my boys would go to! We used to watch these events on tv in my area before they started coming here. Looks like you guys had a great time! Your husband looks like he thoroughly enjoyed the event lol. Great pictures. We went years ago when my kids were younger. They LOVED it. OMG now this looks like an insanely good way to spend an evening. 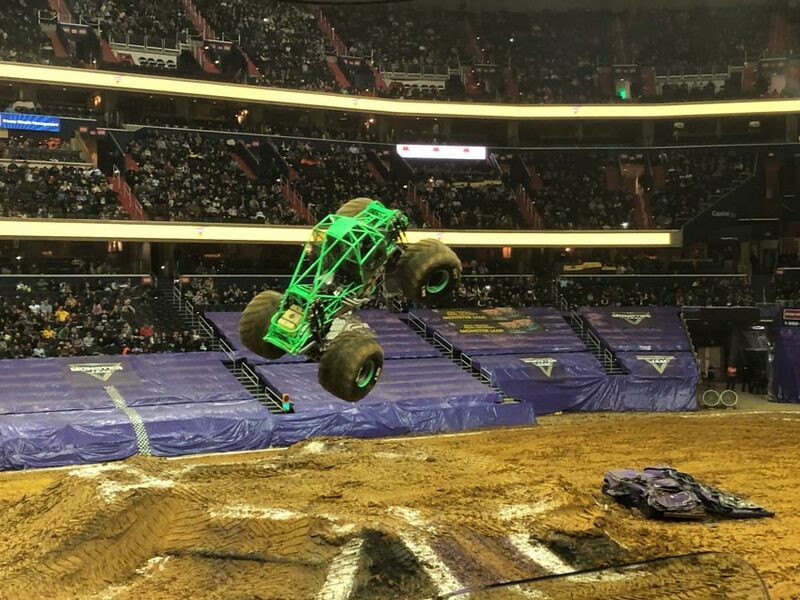 Can’t say I’d ever thought about going to a Monster Jam, but I’m kind of intrigued now. Wait these are still around?? Wow I had no clue, I never had an interest to ever attend but I am sure it could be a family bonding experience for those who do attend! These are some great tips! Looks and sounds like you guys had a great time! I have heard of Monster Jam, but never been.